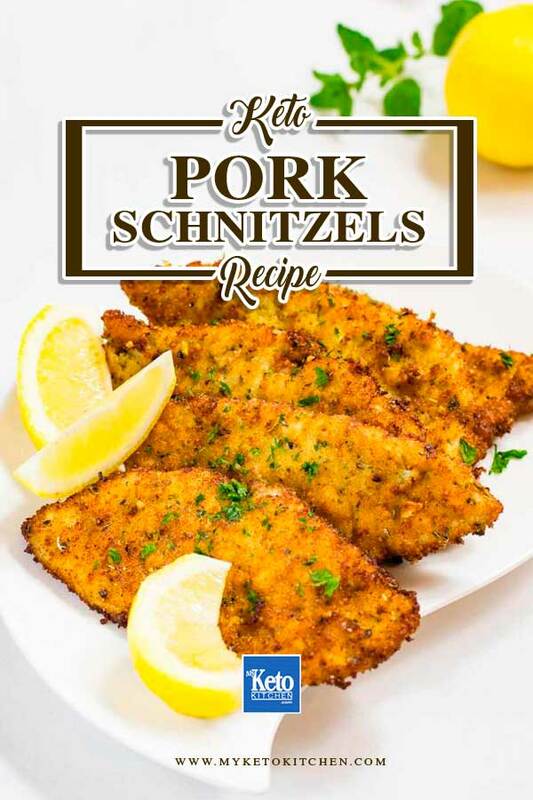 This Keto Schnitzels recipe is crispy on the outside with moist and tender pork on the inside. We like to serve ours with a side of Buttery Cauliflower Mash and a squeeze of Lemon. They’re also great accompanied by our Sour Cream & Chive Broccoli Mash. 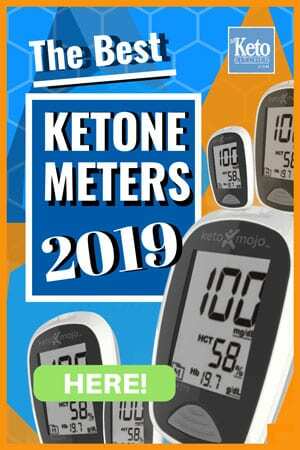 This keto shcnitzels recipe makes 4 serves. These schnitzels can easily be cooked ahead of time, sliced and added to a salad for lunch or dinner. While we’ve used pork top round steaks for our keto schnitzels. Boneless pork chops, loin and tenderloin also work well. Preheat your deep fryer to 180C/355F. Using a meat mallet or tenderizer or rolling pin, pound the pork steaks to a thickness of 1/4in/0.5cm. In a bowl, add the egg, cream and water and whisk until combined. On a small baking tray, sprinkle over the parmesan, Italian Herb & Spice Blend and pepper. Give a light stir to mix the “breading”. Dip each pork steak into the egg mixture and then coat in the parmesan mixture. Pressing the parmesan into the steak. Gently place the schnitzels into the deep fryer and fry until golden brown and cooked through. Approximately 5 to 7 minutes. If you have a small deep fryer it is best to fry the schnitzels in batches to prevent them from sticking together. Remove the schnitzels from the oil and allow to drain before serving. 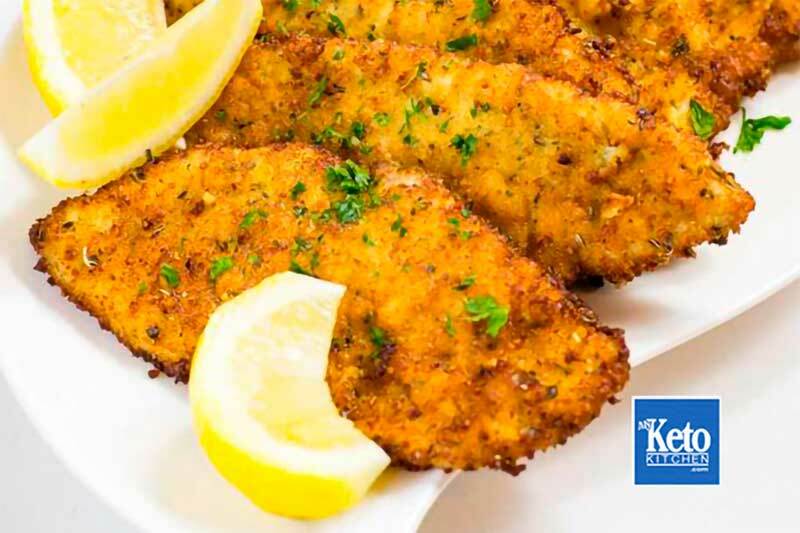 Our Parmesan Herb Pork Keto Schnitzels are crispy on the outside and moist and tender on the inside. Using a meat mallet or rolling pin, pound the pork steaks to a thickness of 1/4in/0.5cm. On a small tray, sprinkle over the parmesan, Italian Herb & Spice Blend and pepper. Give a light stir to mix the “breading”. 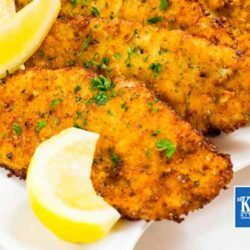 To make a larger batch of this Keto Pork Schnitzels recipe adjust the card above. How to Make Spanish Baked Eggs – High Flavor, Low -Carb!